Reggio Emilia is an educational philosophy based on respect, responsibility and community through a child-guided curriculum. Frog Hollow Children's Centres have been inspired by this rich approach for more than 10 years. Continue reading below, or click here to return to the previous page. The Reggio Emilia approach began in the city of Reggio Emilia, in post World War II Italy. Jaded from years of dictatorship, hardship and inequality, parents of young children came together to build a school using the scraps of demolished buildings and the money from sold surplus war materials. Based on the belief that education is key to a democratic society, the parents had a vision of schools where children and their families were active participants in their learning. They sought help from Loris Malaguzzi, an educator who shared their vision. Together they founded an educational approach that continues to inspire educators around the world. Children are born with the ability to explore and ask questions about the world. They are also born with the capability to offer answers and solutions to their questions when provided the right physical, emotional and social environment. Children are social beings always in contact with their surroundings. Children learn best by interacting with those around them, including other children and adults, and material. Children have “one hundred languages” in which they express themselves. It is the educator’s responsibility to be sensitive and to respect all hundred languages. Children have the right to beautiful environments and learn best by manipulating open-ended, stimulating, real material. Learning is a long-term reciprocal process and children learn best when a proposed learning experience is based on their own interests and curiosities. Educators are partners in learning with children, continuously asking meaningful questions and engaging in with children’s explorations. 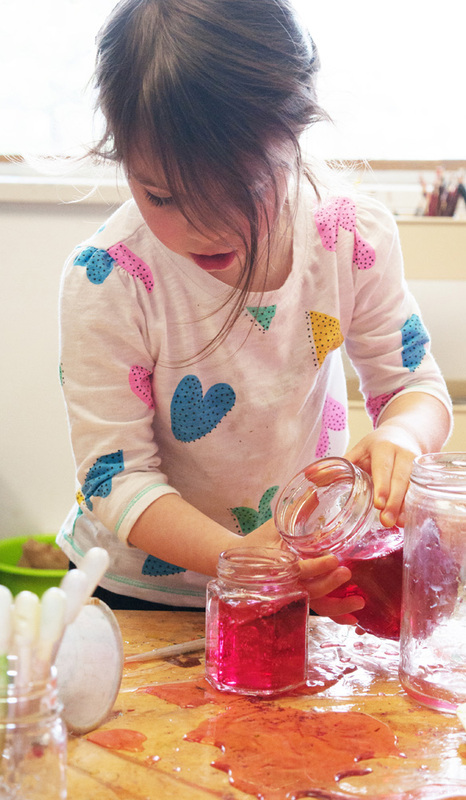 Educators observe and document children’s interactions and learning; reflect on their experiences and express further curiosity; share their observations and curiosities with children, parents and other educators to open dialogues; design new experiences for children to further their knowledge. Parents play an important role in their child’s education. They offer ideas, feedback and Several gathering opportunities are provided for parents to come together in small or large groups or on individual basis. We call our approach, “Reggio-inspired” because it is based on the principles and values of the Reggio Emilia approach, but not exclusively. Our cultural and historical reality in BC is quite different from that of Italy and we must incorporate our approach in a way that fits our community. For more information about the Reggio-Emilio approach visit our Resources and Reading section.